Inspired by the California lifestyle, this yoga mat is made from recycled neoprene wetsuits. Retired from surfing and diving duty, neoprene wetsuits complete their California life cycle in this yoga mat. The cushioning, insulating material is recycled to create generously sized, premium quality mats that make great companions for your practice. 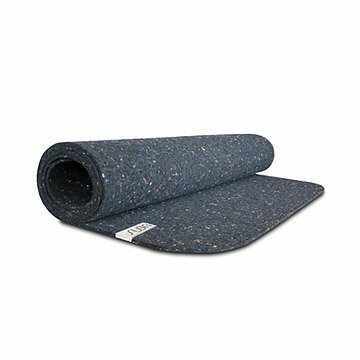 Neoprene is a closed cell foam, so it won't accumulate dust and bacteria from yoga studio floors. Production of these mats keeps wetsuit waste out of landfills, and the mat itself may be recycled when its yoga days are done. Made in California. Only when necessary, rinse with water and hang to dry in shade until completely dry. Do not use strong soaps or detergents, only mild soap if necessary. I wanted to love this mat- I did not want to be on the band wagon of all the "fad name brand" mats everyone has. This was so unique and I loved the concept behind it. I have given it a try since Christmas as it was a requested gift from my husband. Each yoga class I experience slipping and my mat will actually bubble up and move on jump backs. I have gotten many compliments on the look of the mat. It even appears it will be grippy, but it is not and with added sweat. it is even more slippery. This mat is great! I love this mat and the mission behind it! I'm forever going to recycle my wetsuits here from now on. Its very non slip but it is a bit heavy. Not a problem for me, just a note. Wanted this to help stretch and do some light yoga at home and it's great! It's not slippery like many yoga mats and I love that it's recycled ! The first time I took this yoga mat to class, I had three people ask me about it. It's very cool. It's a little heavier than my old mat, but it's very sturdy and should last a long time. Works well for hot yoga - not slippery. It does have a slight smell. Nothing bad, just a different odor. I expect it to go away after use and cleaning. It's nice that I'll be able to recycle it eventually. My husband is just starting yoga for the first time, so I wanted him to have a cool mat to use. This one has a really cool, sleek look, but it's as comfortable and functional as you'd expect a good mat to be. I love knowing that it's made from recycled materials that have found a new lease on life. I love that this product is recycled and if I don't want it anymore I can return it to Suga and they will recycle it. It's also not as heavy as you would think considering it's made from wetsuit material. It stays put when I'm using it on my hardwood floors; I love it! I was in the market for a new yoga mat and nothing was catching my eye. This did and is amazing. It looks good, is super sturdy and I LOVE that it is recycled material! Win, win, win! !